Colonial Craftsmen focuses on historical home renovation and specializes in copper and slate roofing. 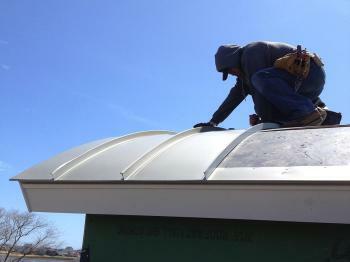 We also work with all types of roofing, metalwork, cedar siding and custom carpentry. Our experience and craftsmanship have created and restored many lasting impressions throughout the Greater Boston area since 1983. We are a true full-service contractor for home exteriors and pride ourselves on the relationships we've formed with our customers over the years. Most first-time customers become repeat customers, inviting us back for additional services to their home. We do not hire subcontractors—if there's something we can't do, we let our clients know and are happy to recommend alternatives. Many of our services overlap, so please feel free to roam through our project galleries to see everything we do and contact us if you have any questions.